A Thank You Page is a page on your website that your visitor can access a certain marketing offer and/or tell them what to expect next. In most cases, this is also the part where conversion tracking is placed. Here’s an image that you’re probably familiar with. Generic Website Pages. These are the static pages of your website, e.g. the homepage. Blog Posts. These are the dynamic portion of your website, e.g. this post, or this one. Landing Page. 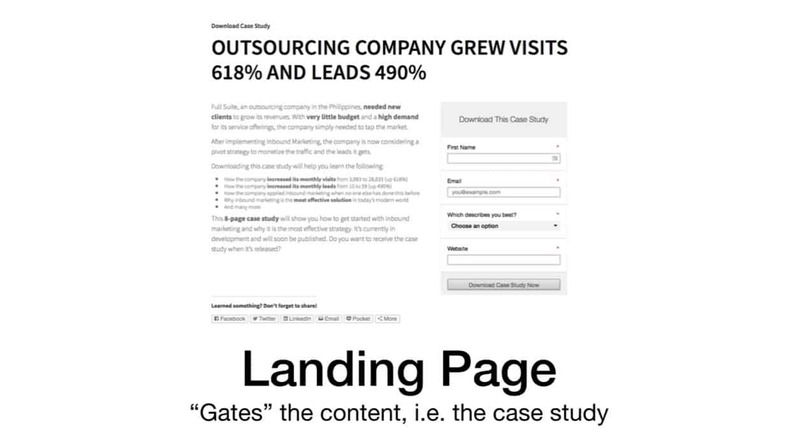 Landing pages are specific pages on your website designed to convert visitors. It’s used to “gate” certain types of content so only those that fill-up a form will be able to access the content. After the visitor fills up a form, they are redirected to the thank you page. Thank You Page. I’ll discuss this more below. Thank You Email / Delivery Email. This is a special kind of email. It can only be “accessed” by those who went through your landing page (as depicted by the dotted line). It can either contain a link back to the thank you page or used to deliver the offer itself (download link for a PDF report). Here’s how they all work together. I labeled them so it’s easier to follow along. Now that you have successfully converted your visitor, the next step is to keep them engaged. That means you bring back the navigation menu so they can take a look at the other parts of your website again. They just entered their private information. If they don’t know you, there’s some sort of doubt and fear in the minds. Simply thank them and show your appreciation. This is the MOST important element that I’ve seen so many marketers fail to include properly. I’ll say this again. This is the most important element. The thank you page must deliver on the promise you gave beforehand immediately and clearly. For example, if you decided to download the case study or the white paper I made, upon reaching the thank you page, you will be able to download it without it. No more additional steps. No further hassles. Sure, there are variations in which you can do this. For example, you don’t put the download link in the thank you page, but use the thank you email/delivery email instead. And that’s ok. But the crucial part here is that you have to CLEARLY explain that. Here’s a great example where the offer is a webinar. 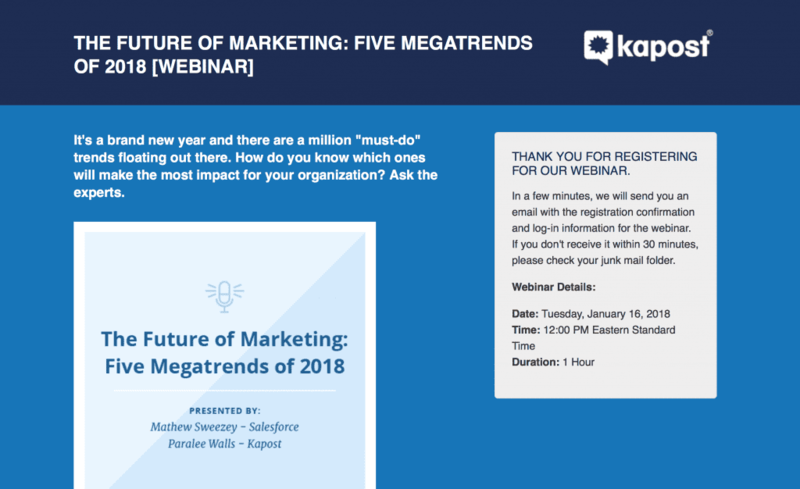 Since you can’t access that webinar immediately, they clearly explained the next steps and what to expect. I’ve seen a lot of organizations get this wrong. For example, they offer a PDF download. Then, when you get to the thank you page they are trying to sell you something. Then you try a cmd + F to search for the word “download” and it’s nowhere to be found. So you check the thank you email. It’s the same thing. No download link. Only salesy message. They ask you to subscribe or pay them this to access it further. That’s misleading. And, in my opinion, unethical. Don’t ever do that. I recently posted another article that that’s probably the biggest reason your email list isn’t growing. Add a secondary offer or call-to-action (CTA) on your thank you page. This works best if you add the logical next step in the process. For example, your offer is a free social media calendar. Then, your logical next step offer might be a free trial of your social media scheduling tool (assuming you’re Buffer or HootSuite). In the example I used, I simply added the only other offer I have. While it’s not the best use of the secondary offer, it is still better than having nothing at all. Also, feel free to use videos here or more graphical images. Tracking conversions is one of the activities you should focus on as a marketer (instead of looking at likes and shares). 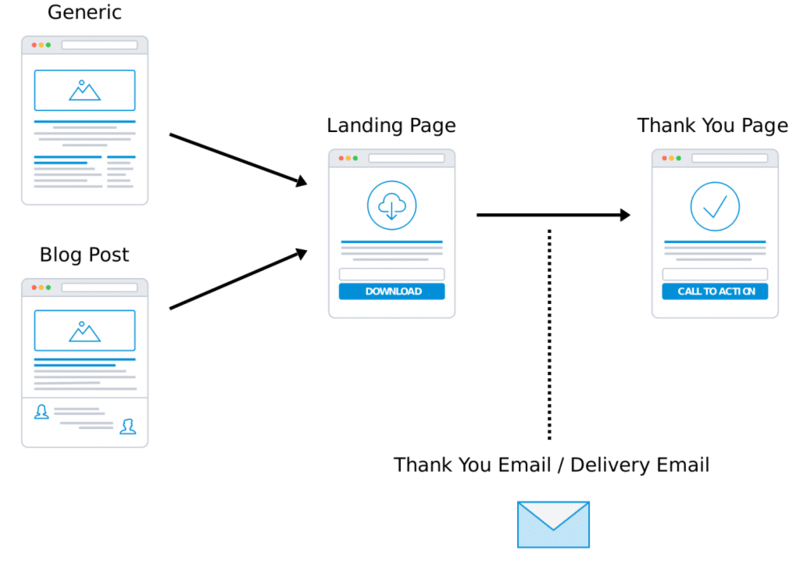 Conversions are any meaningful actions performed by your visitors. These are defined by you. Most of the time, the industry and/or the campaign determines what a conversion is. Some examples of conversions are form submissions and a purchase. These conversions are, traditionally, tracked using thank you pages. Because theoretically, no visitor should be able to reach your thank you page unless they fill out the form on the landing page first. One of the attributes of an effective thank you page is a unique URL — meaning, a unique page on your site. Just as you should have multiple landing pages (for different offers), you should also have multiple thank you pages. It’s best to have a 1:1 ratio. That way, you can customize your message every single time. 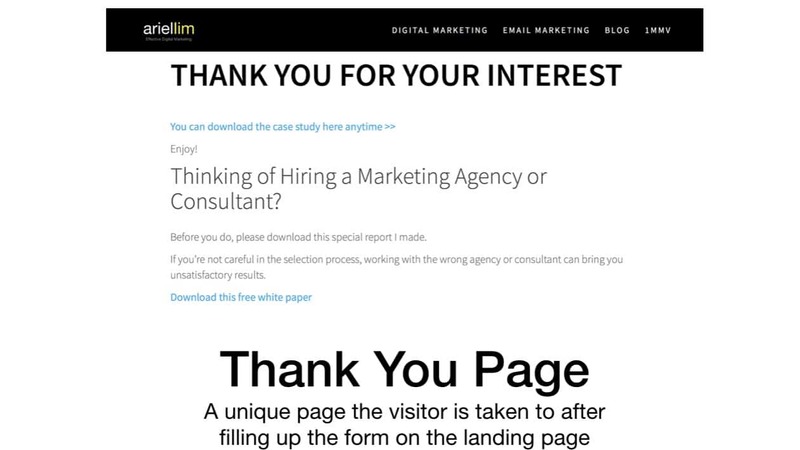 Imagine if you only have one thank you page for the different landing pages you have. So a person who downloaded a PDF will see the same page a person who subscribes to your newsletter. How, then, can you personalize your appreciation? A lot of popular analytics software and advertising platforms use this kind of tracking. Google Analytics, AdWords, and Facebook all use the thank you page as a way to track conversions. Are you using landing pages and thank you pages on your website? If not, you’re probably not hitting your conversion targets. Remember, a landing page’s average conversion rate is only between 1-3%. 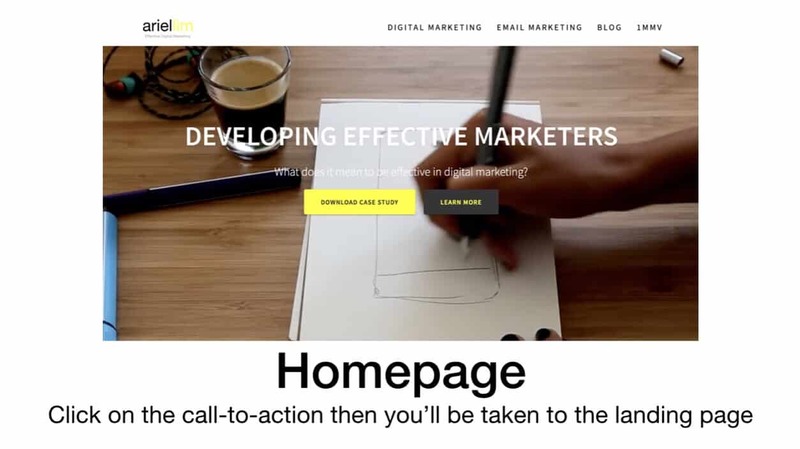 If you’re like most organizations, the only landing page you have on your website is the contact us page. Think about how many traffic you need to visit that contact us page before you hit your targets. And if you’re not creating marketing offers and setting up landing pages on your site, you’re probably saying that digital marketing is not for your industry. But really, is it because of the industry, or is it because of you?